1. Marinate the meat in the curd mixture for 30 minutes. 2. Heat 5 tbsp ghee in a pan. 3. Add cardamoms, shahjeera, cloves, bay leaves and peppercorns. 4. Add rice and stir fry for 6 minutes. 5. Add milk and hot water and salt. 6. Cook till the rice is done. 7. Heat 6 tbsp ghee in a pressure cooker. 8. Add meat and fry till golden. 9. Add one cup of water and pressure cook till meat are soft. 10. Open lid, add potatoes and cook for a further 5 minutes till potatoes are done. 12. In a large pan arrange a layer of rice. 13. Sprinkle saffron, fried onions and dry fruits. 14. Cover with a layer of meat. 15. Continue till all meat and rice are over. 16. Cover tightly and place on a hot griddle or in a hot oven for 5 to 7 minutes. 18. Garnish with egg halves and coriander and mint leaves. 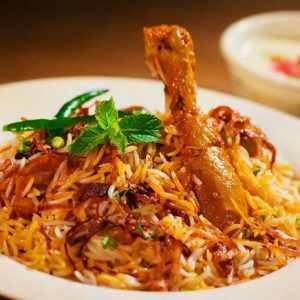 Feel free to comment or share your thoughts on this Degchi Biryani Recipe from Awesome Cuisine.